Storlazzi, Curt D.; Cheriton, Olivia M.; Messina, A. M.; Biggs, Trent W.
Storlazzi, Curt D.; Gingerich, Stephen B.; van Dongeren, Ap; Cheriton, Olivia; Swarzenski, Peter W.; Quataert, Ellen; Voss, Clifford I.; Field, Donald W.; Annamalai, Hariharasubramanian; Piniak, Greg A.; McCall, Robert T.
Storlazzi, C.D., Gingerich, S.B., van Dongeren, A., Cheriton, O.M., Swarzenski, P.W., Quataert, E., Voss,C.I., Field, D.W., Annamalai, H., Piniak, G.A., and McCall, R., 2018, Most atolls will be uninhabitable by the mid-21st century because of sea-level rise exacerbating wave-driven flooding: Science Advances, v 4, eaap9741, https://doi.org/10.1126/sciadv.aap9741. Storlazzi, Curt D.; Cheriton, Olivia; Rosenberger, Kurt J.; Logan, Joshua B.; Clark, Timothy B.
Storlazzi, C.D., Cheriton, O.M., Rosenberger, K.J., Logan, J.B., and Clark, T.B., 2017, Coastal circulation and water-column properties in the National Park of American Samoa, February–July 2015: U.S. Geological Survey Open-File Report 2017–1060, 104 p., https://doi.org/10.3133/ofr20171060. 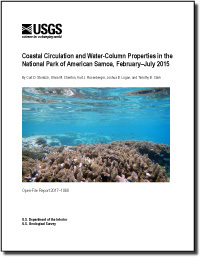 Cheriton, Olivia; Storlazzi, Curt D.; Rosenberger, Kurt J.
Cheriton, O.M., Storlazzi, C.D., and Rosenberger, K.J., accepted online, Observations of wave transformation over a fringing coral reef and the importance of low-frequency waves and offshore water levels to runup, overwash, and coastal flooding: Journal of Geophysical Research – Oceans, doi:10.1002/2015JC011231. Storlazzi, Curt D.; Cheriton, Olivia M.; Lescinski, Jamie M.R. 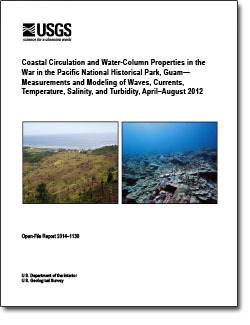 ; Logan, Joshua B.
Coastal circulation and water-column properties in the War in the Pacific National Historical Park, Guam: measurements and modeling of waves, currents, temperature, salinity, and turbidity, April-August 2012; 2014; OFR; 2014-1130; Storlazzi, Curt D.; Cheriton, Olivia M.; Lescinski, Jamie M. R.; Logan, Joshua B. Suspended particulate layers and internal waves over the southern Monterey Bay continental shelf: an important control on shelf mud belts? Cheriton, Olivia M.; McPhee-Shaw, Erika E.; Shaw, William J.; Stanton, Timothy P.; Bellingham, James G.; Storlazzi, Curt D.
Suspended particulate layers and internal waves over the southern Monterey Bay continental shelf: an important control on shelf mud belts? ; 2014; Article; Journal; Journal of Geophysical Research: Oceans; Cheriton, Olivia M.; McPhee-Shaw, Erika E.; Shaw, William J.; Stanton, Timothy P.; Bellingham, James G.; Storlazzi, Curt D.
Storlazzi, Curt D.; Field, Michael E.; Cheriton, Olivia M.; Presto, M.K. ; Logan, J.B. Rapid fluctuations in flow and water-column properties in Asan Bay, Guam: implications for selective resilience of coral reefs in warming seas; 2013; Article; Journal; Coral Reefs; Storlazzi, C.D. ; Field, M.E. ; Cheriton, O.M. ; Presto, M.K. ; Logan, J.B.
McManus, M.A. ; Cheriton, O.M. ; Drake, P.J. ; Holliday, D.V. ; Storlazzi, C.D. ; Donaghay, P.L. ; Greenlaw, C.F. Effects of physical processes on structure and transport of thin zooplankton layers in the coastal ocean; 2005; Article; Journal; Marine Ecology Progress Series; McManus, M. A.; Cheriton, O. M.; Drake, P. J.; Holliday, D. V.; Storlazzi, C. D.; Donaghay, P. L.; Greenlaw, C. F.